Selecting the right eyeglasses for you is a process that requires research and informed decision-making. This might be difficult, especially if you don’t know what you are looking for and don’t have the time needed to make this decision.Eyeglasses need to be comfortable while also suiting your facial shape and your personal style. Think about it – you are going to be wearing these glasses for at least a few hours a day, if not the whole day. That’s why we have come up with this list of the 5 best eyeglasses to help you make an educated decision that will have you seeing life in a new light. 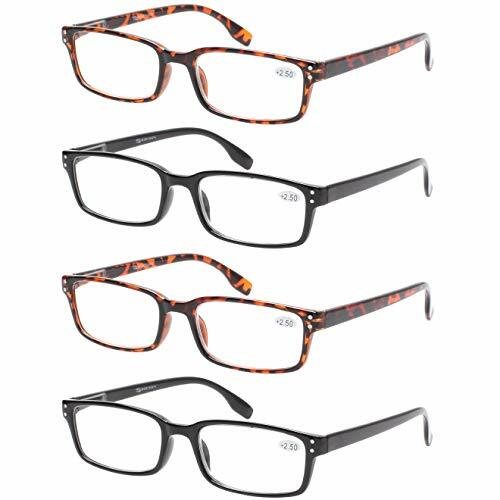 If you find yourself needing reading glasses but don’t want to spend an arm and a leg, this convenient and durable set of four specs by Kerecsen will suit your needs perfectly. These reading glasses are made from durable plastic which is tough and sturdy. The lenses are non-polarized and plastic, so you don’t need to handle them with too much care when placing them on your face or folding them away when you’re done.The lens width is available in 53 millimeters and the set comes with four pairs, so you can place a pair in your regular reading spots. The lens height is 30 millimeters, which suits most facial shapes and ages. The bridge is 19 millimeters and rests perfectly on most noses, and the arms are 140 millimeters, the most common arm length. These reading glasses can be worn by both men and women. They are ideal for use at home, at work or when eating in restaurants. These reading glasses are available with a magnification of 0.5 to 6.0 diopters, allowing you to find the perfect set for you. The plastic frames are so lightweight and comfy that you might forget you are even wearing glasses. These glasses also have durable spring hinges so you can easily fold your glasses away as needed. These lenses are unisex and can be worn by anyone at any age. 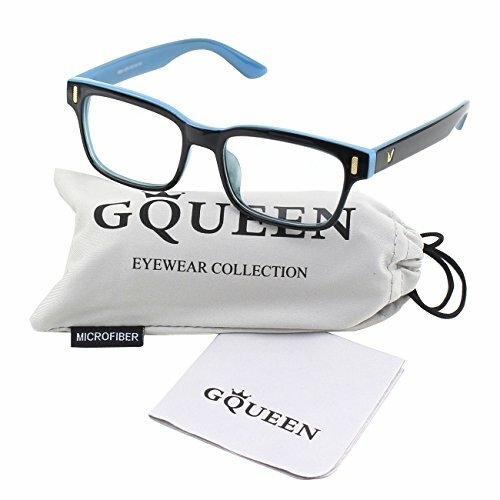 Each of the 4 pairs of glasses comes with its own microfiber soft case and a cleaning cloth, all for less than $13 (at the time of writing). The lenses can be difficult to clean and buff should they get scratches. However, at the price, this is not a huge problem. If you are looking for some everyday glasses that will suit your outfit no matter what you are wearing, then then Wayfarer glasses by TIJN may be just what you are looking for. The different color varieties mean that there is a frame for everyone. The look is tasteful without being dated. In fact, these glasses are quite fashionable and stylish. These glasses are not well suited for people with wider faces. Some users reported that the frames are not as strong as they had hoped for, and some frames cracked or broke. This value pack includes 5 ladies reading glasses at a very reasonable price. These glasses are perfect for home, bedside or office use. These glasses have durable plastic frames and non-polarized plastic lenses that are clear and strong. Their universal size suits most ages and face shapes. 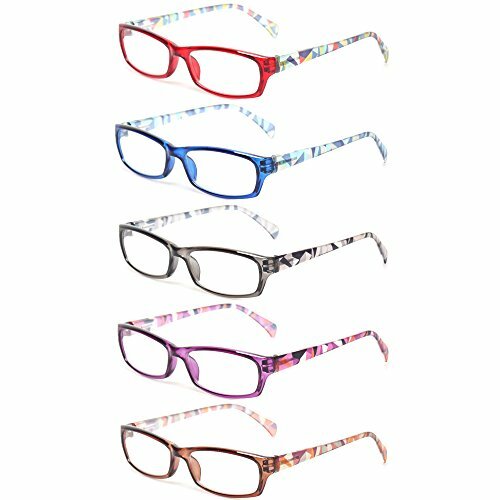 The classic shape is complemented well by the colorful design that offers a fresh and stylish look.The Kerecsen Ladies Glasses are available in five different colors: red, blue, gray, purple and brown. The plastic frames are lightweight and durable. The hinge has springs which ensure that they fit comfortably without pinching. They also do not place any pressure on your nose when you are wearing them.You can choose from a variety of magnifications from 0.5 to 6.0 diopters.The frame height is a sleek 27 millimeters and the lens width is 54 millimeters. The arms are a comfortable 140 millimeters long, allowing you to place them snuggly behind your ears without worrying about them slipping off your face.These glasses come with a 90-day full money back guarantee as well as a 1-year warranty against any manufacturer’s defects, speaking to the high quality of these specs. The five colors are all attractive and stylish, allowing you to find one that suits your style. Alternatively, you can buy them all and use a different one every day of the week. The plastic frames and lenses are durable and sturdy. Some users complained that the lenses were cloudy and blurry. They are also not ideally suited to users who have wide faces as this may result in the temples breaking. Fashion is always changing, so you need a pair of glasses that conform to every style and trend. These affordable glasses suit most wearers and allow you to step out with confidence knowing that these lightweight glasses have your back. These modern glasses by GQUEEN have strong composite frames and polycarbonate lenses. They are lightweight and comfortable to wear every day. They have a sophisticated look that suits most faces and ages. They are also suitable for both men and women.The glasses come along with a microfiber cleaning cloth and a carry pouch to keep your lenses safe and scratch-free. The smooth and simple design ensures that these glasses are versatile and stylish, no matter where you wear them.The lens width is 52 millimeters, which suits most faces. The lens height is a modern and sleek 36 millimeters. The bridge is 15 millimeters allowing it to rest comfortably on most people’s noses. The arm is a standard 140 millimeters and fits easily behind your ears.The lightweight yet sturdy frames rest cozily on your ears and nose, so you should be able to wear them for hours on end without them becoming uncomfortable. These glasses also have a 30-day money back guarantee which speaks to the quality and durability of their build. The English-style nosepiece looks modern and edgy while still sporting a classic allure. They are suitable for both men and women and can be worn at any age. These glasses can be a bit large for slimmer faces. Some users reported that their glasses broke at the temple due to the screw being stripped and poor construction. These glasses are modern and stylish while still being durable and sturdy. If you are looking for an up-to-date pair of glasses that are good quality with a fun design, these glasses may be just what you need. Product Measurements: Lens Width - 50mm(1.97"), Lens Height - 44mm(1.73"), Bridge - 20mm(0.78"), Temple Length - 130mm(5.12"), Frame length:130 mm (5.12"). 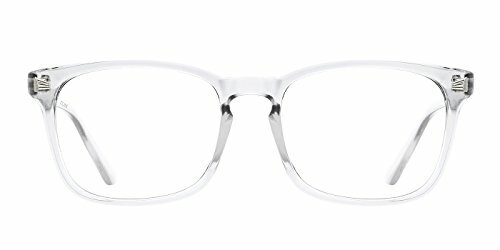 High Quality Materials: The structure of this prescription eyeglasses is outside plastic full-rim combined with inside metal half-rim. The soft silicon nose pads can provide you comfortable feeling. Double reinforced frame and durable metal hinges will ensure you a long time wearing without deformation. These round glasses by Amomoma have plastic frames with a metal half-rim inside and interchangeable non-polarized lenses. These glasses are suitable for both men and women of any age. The frames have a stylish yet classic appearance that should suit almost any face shape.The bridge is 20 millimeters wide and is comfortable to wear, even for longer periods of time. The silicon nose pads are also soft and comfy.The frames are more rounded than rectangular, with a lens width of 50 millimeters and a lens height of 44 millimeters. The arms are 130 millimeters, making these glasses suitable for most adults, and the durable metal hinges and reinforced frame ensure a sturdy pair of glasses with a stylish look.These glasses are available in 5 colors: pink, red, black, green and tortoise. This means you can find the perfect pair to suit your style, or you can choose all of them for the variety. These glasses have slim, polished temples that pair a trendy appearance with comfort. The five different colors allow you to choose one that suits your style, face and hairstyle. The frames are very big, so they are not suitable for people with smaller or slimmer faces. Some users have also reported that the build quality was not what they expected, especially with regard to the screw in the temples. When choosing the best eyeglasses, there are a few important features to consider that ensure you have the best experience. The most important features include the following. Glasses frames are normally made from either plastic or metal. Plastic is very popular due to being inexpensive, lightweight and durable, making this a popular material for children as well as adults who wear glasses occasionally for a single purpose such as driving or reading.Metal, on the other hand, is hypoallergenic, strong and corrosion-resistant. Metal frames are much harder to break, making them a great choice for those who wear glasses all day or those who expect their glasses to take a few knocks when worn. Typically speaking, your facial shape will play a large part in what type of glasses frames you choose. For example, people with angular or slimmer faces should choose rounder frames, while those with rounder faces should consider more angular frames. People with oval faces have the benefit of being able to select between either angular or round frames, as both will suit their faces. When selecting glasses, consider what you will be using them for. If you will be wearing them all day, comfort is the main priority. If they are only occasional glasses worn when reading or driving, comfort is still a priority, but you may consider a lower price first.Also look at your age group and what other people your age are wearing. Despite being a vital tool for seeing more clearly, glasses are also often seen as a fashion accessory due to their prominence on your face, so considering the trends may also help you make a decision. If you have a warm skin tone with golden or bronze undertones, avoid pastels and contrasts. It’s better to choose brown, green, beige or gold frames. If you have a cold skin tone with blue or pink undertones, opt for black, silver, grey, blue, purple or pink frames. The frame of your glasses should be a bit wider than your face. The tops of the frames should be in line with your eyebrows. The bridge should sit flush on the bridge of your nose without sliding down. It is important that you get the correct size glasses or you will be uncomfortable when wearing them. It should go without saying that the style of your glasses is very important. Your frames should be comfortable, of course, but they should also be durable and compact while suiting the shape of your face.You may find that metal frames look too heavy on your face, so you may prefer to opt for plastic frames. Some people find that dark rectangle frames look best on them while others prefer lighter colored rounded glasses.When selecting a style of glasses, consider your needs and how much you plan to wear your glasses. Also look at which material, color and shape would look best on your face. Can you clean your glasses with rubbing alcohol? It is important to clean your glasses regularly, and rubbing alcohol is a great way to do so. Mix an ounce of rubbing alcohol with two ounces of distilled water and spray the solution onto your specs. Wipe your eyeglasses with a clean cloth until the lenses are clean and spotless. You can also use one ounce of rubbing alcohol with four drops of dishwashing soap and follow the same method as above. 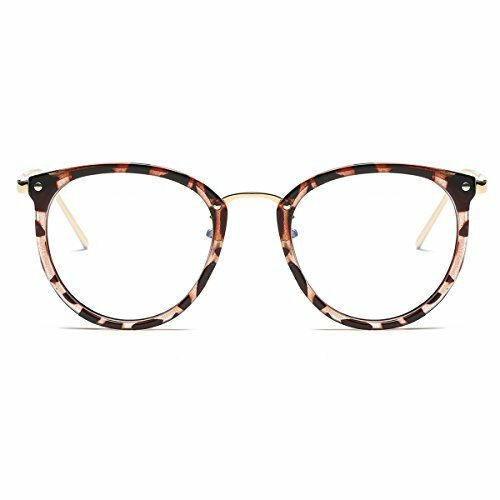 How to pick the right glasses frame for your face? There are three main factors to consider when choosing the right frames: your facial shape, your lifestyle and your personality. Your facial shape is naturally the first consideration, discussed in question 5.Next, consider your lifestyle. If you live an active lifestyle, choose lenses that are flexible and durable. If you wear your glasses around the office, look for frames that suit your work style so you can accessorize.Lastly, select glasses that suit who you are as a person. If you are fun-loving and funky, don’t choose plain black glasses, but rather choosing glasses with flare or embellishments. Can you use reading glasses frames for prescription lenses? While you can use reading glasses frames with prescription lenses, inexpensive reading frames usually aren’t designed for removing and inserting lenses. If you have purchased metal frames with a screw barrel on the side that allows for the lens to be inserted and removed, then they can be used with prescription lenses.The general rule of thumb is to avoid using reading glasses for prescription. You will save yourself money and time by using reading glasses for reading and purchasing a proper pair of prescription glasses if necessary. Single vision lenses have the same focal power across the entire lens. Single vision lenses are used when you only need the glasses for one purpose, such as reading or driving. This is different to bifocal lenses where there are two distinctly different focal strengths that allow the person to see far and near through the same lenses. What shape of glasses will suit my face? If you have a rounder face, a safe bet is to normally go for more rectangular frames. If you have a sharper, slimmer or more rectangular face, consider wearing rounder glasses. For those who have an oval face, most glasses shapes will suit your face. Naturally, trying on glasses is the only true way to know if they suit your face, but the above is a pretty good guide. Astigmatism is a common optical condition where the eye doesn’t focus light onto the eye’s retina evenly. Eyeglasses can correct astigmatism, as can contact lenses and surgery. You should select the most appropriate solution depending on your lifestyle. However, glasses are the safest and simplest way to see clearly and correct your astigmatism. Owning the right pair of eyeglasses for you is vital. Choosing a pair of glasses that don’t suit your face may leave you feeling uncomfortable and self-conscious. That is why we have found five of the best eyeglasses that suit most people, making these specs the perfect place to start. These glasses are all reasonably priced, stylish, unisex and durable, so even if you find that one doesn’t suit you, it is easy to try another pair. After carefully reviewing and considering the best eyeglasses, our recommendation for the pair of glasses best suited for most people is the Kerecsen Ladies Reading Glasses thanks to the variety of stylish and attractive colors as well as their stylish yet classic look. They are suitable for ladies of all ages and are durable and sturdy. The five pack set allows you to keep a pair in each place where you might need them. The 1-year warranty also speaks to the quality of these glasses.